Doctors have described his condition as "very rare" and "a world record". "Ashik's malaise was diagnosed as a complex composite odontoma where a single gum forms lots of teeth. It's a sort of benign tumour," Dr Dhiware said. "At first, we couldn't cut it out so we had to use the basic chisel and hammer to take it out. "Once we opened it, little pearl-like teeth started coming out, one-by-one. Initially, we were collecting them, they were really like small white pearls. But then we started to get tired. We counted 232 teeth," she added. Describing Ashik's case as "very rare", Dr Dhiware said she had "not seen anything like this before in my 30-year career", but said she was "thrilled to get such an exciting case". "According to medical literature available on the condition, it is known to affect the upper jaw and a maximum of 37 teeth have been extracted from the tumour in the past. 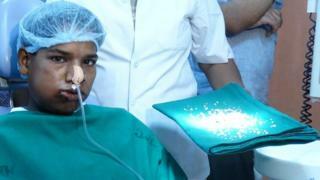 But in Ashik's case, the tumour was found deep in the lower jaw and it had hundreds of teeth." "I was worried that it may turn out to be cancer so I brought him to Mumbai," he said.